What fashion lover doesn't love shoes? I've compiled the strangest shoes in fashion today that even the biggest fashionista may or may not love. These shoes are Beautiful, innovative, funny, and some are even disturbing. Be prepared, any preconceived notions you have about shoes are about to change! This strange shoe features a heel that's not quite where we're used to seeing it. 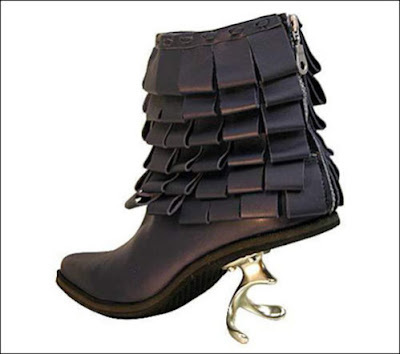 If that's not enough, a second strange element was incorporated into the fashion shoe's design; a corkscrew heel. 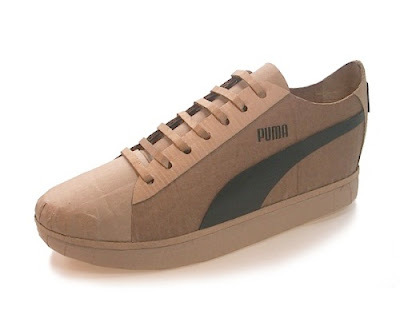 While this shoe at least serves one fundamental purpose of a shoe; covering your foot, it's missing another key element. Fashion lovers willing to risk wearing this design better be professional acrobats, because walking cannot be an easy feat. Artist Mike Leavitt is featuring a cardboard shoe show in NYC on April 18, 2009. The shoe designs, at a glance, don't look so unusual since the follow sneaker designs of popular shoe manufacturers. It's the material that makes them different. While it might be a great idea for a sustainable fashion statement, these shoes would hit the recycling box after an encounter with inclement weather. 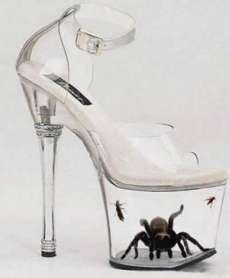 The tarantula shoe is a sky-high platform design that might be a danger to weak ankles, but this scary fashion oddity is the most dangerous shoe in the world for a very different reason; encased in the fashionable item is a live tarantula. Since goldfish shoes went out with the 70s, someone had to come up with a new living shoe design. No word whether or not this fashion might present an animal rights violation or if the tarantula has the ability to be removed. However, there's no doubting that this scary shoe makes a bold and dangerous fashion statement. Who says fashionistas can't be gamers too? 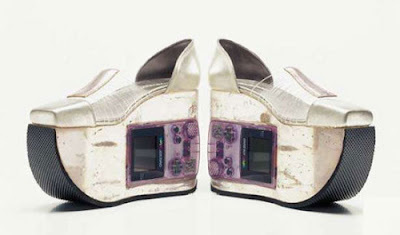 This geeky shoe design features working retro Gameboys which can actually be removed and played. This multi-function fashion item serves both as a functional shoe and a portable entertainment system! These strange shoes aren't actually made by Hot Wheels; they're designed by Ronaldo Frago. The perfect shoe for mothers on the go since shoes can double as entertaining toys for small children. 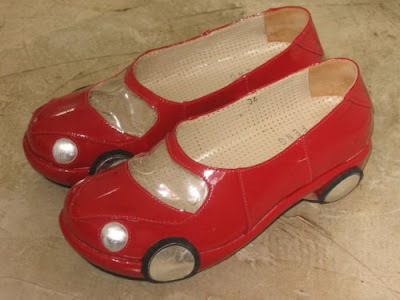 So the wheels aren't real, but these functional flats sure are cute! Talk about fashion statement! 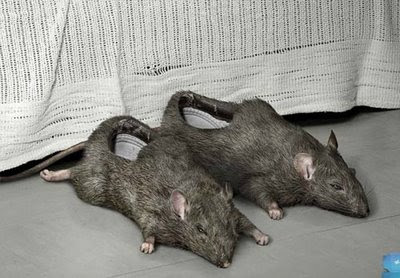 This disturbing shoe might be great for Halloween, because its dead rat design could certainly scare the daylights out of anyone. This scary shoe is not for the faint at heart. But what were they thinking? This neat shoe is a walking piece of art in design and function. Lover of greener pastures and livestock? Then this shoe is definitely for you. 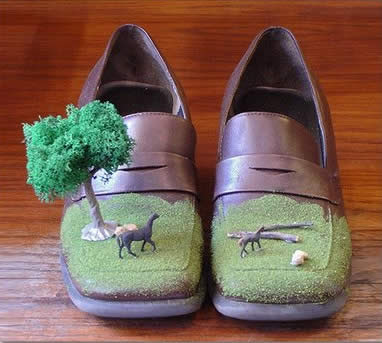 It's unique design built onto the shoe includes a tree, cow, horse and stray lumber. these shoes are really unique but these shoes are also impractical. "While the sneaker design may be comfortable and practical off the runways; you certainly better plan ahead when nature calls." When you are out do you fully remove your trousers to use the toilet? That is rather strange and abnormal in my opinion, as you aren't meant to strip to do it. You just pull them down. Duh. Really very difference style but i like it. 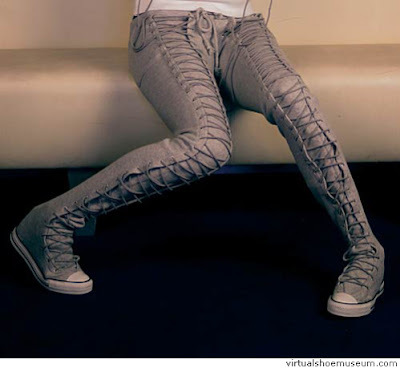 In love with the pants shoes, where can I get one ? and who's the designers of the shoes?